The Cape Flyer is an exception as well right? It has a beer / wine right? Edit: Also, is a CR train actually a public space as you need to pay to ride? Is that the exception they use to allow beer / wine on the Cape Flyer or do they have some other special exception or license? I remember long ago I took my son to Cape Cod on the old Cape Cod & Hyannis Railroad. We went to the "Bar Car" for a nice breakfast on the way south. However, because he was a minor he was not allowed to sit in the car and we were refused service. Wasn't the most pleasant experience for either of us. RenegadeMonster wrote: The Cape Flyer is an exception as well right? It has a beer / wine right? That's an interesting point: is it "public space" if you have to pay to get in? If it's being interpreted that way there would seem to be some wiggle room --there are probably reams of case law defining what "public space" actually means. You don’t have to pay to get in. It is not access controlled. Cape Flyer is a chartered train, it is not a service provided by the MBTA. Might be because of the booze on board,their liquor licence would be at stake if a state inspector was on board and saw the minor in the car! That was not the server's choice,that person had to say no. Backshophoss wrote: Might be because of the booze on board,their liquor licence would be at stake if a state inspector was on board and saw the minor in the car! Actually it's because liability. There is no law that says a minor can't be in the bar car or an actual bar in Massachusetts. When outside organizations come in and do training / alcohol sales they way over step what the law actually requires to limit liability. For example, a couple comes into a store, one is above 21, one' a minor. Under law the sale is not illegal unless it is suspected the alcohol is specifically being purchased for the minor. However, they will train you that you can not make the sale if a minor is present with the exception of kids / grandkids. This is because if the person above 21 furnishes the alcohol to the minor, then the minor gets into a car and has an accident killing someone the store who sold the the alcohol can be held liable and have to pay up if sued. It's basically just a cover your rear type thing to limit as much liability as possible. It's not getting in trouble with the law. It's the lawsuits that have you paying up. It also leads to thinks like everyone being carded regardless of age at sporting events such as the red sox or NASCAR. No ID, no beer. They don't care if you are 70. Carding everyone in a party regardless of age was what was trained to us, and store policy back when I worked retail management for a couple years after college when we got a liquor license is exactly what we did. Lots of people were angry with us and thought we were "stupid". Actual law says anyone who looks 30 or under should be carded, but store policy was everyone in a party regardless of age and not following that policy could result in termination for the employee. Also put us managers in a sticky spot for lot complaints on us. Once a sale is declined by someone, that's the end of it. It's not legal for someone else at the same store to override that decision. And most everyone wanted to speak to a manager when they were told they could not buy when they didn't have an ID. I think in most cases, alcohol is prohibited on premises because it's a liability if someone over indulges. If the alcohol is served on the premises, then it would be allowed (but outside alcohol would not be) because the liability falls upon the server to cut the customer off after they've "had enough." If the Cape Flyer didn't have a bar car, and instead had vending machines, for example, alcohol probably wouldn't be allowed. Remind me what killed the Bourne station? (and why it is still not "a thing")? Bourne station? 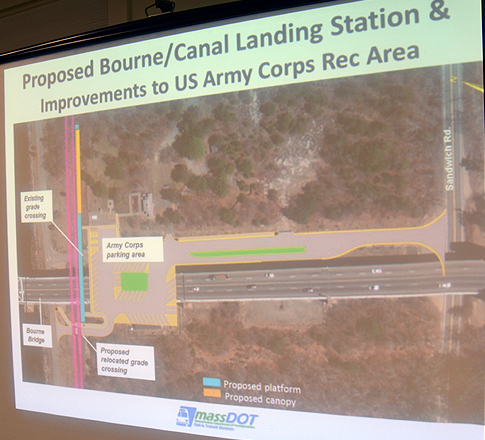 You mean the proposal for one under or near the Bourne Bridge? in late March/April when its time to gear up for The Flyer. Bourne makes a great "kiss-and-ride" and bus connection to points southwest and northeast that going southeast to Hyannis currently runs right past. Arlington wrote: ^ Yes, that one. Refer to my post on 9/2/2017 about Cape flyer platform under the Bourne Bridge that was cancelled and no new proposals have been talked about since. Well good luck with that Tom as you tried to get it built before under the radar so private property abutters & the Town of Bourne government wouldn't know about it until it was actually under construction. When it was discovered Tom got a black eye on that attempt as Town government & residents put him on the hot seat as he was purposely trying to do a go around of the permitting / review process instead of doing it correctly out in the open. Let alone he lives in Bourne and was a State Representative for the Town at one time as well, so much for open transparency. The Bourne Recreation Authority Ice rink which is just a short walk down the Canal from that proposed Bourne Bridge location has offered to have the platform located behind it with a large parking area to serve it, which is where it should be if they want to waste the money to build it for a handful of passenger drop off's who still will have to board a bus to get them to Falmouth / Woods Hole. If they want to be serious about serving passengers to Falmouth / Woods Hole then restore service to North Falmouth as Turkington made sure service would not ever get to downtown Falmouth again with the removal of the rails for a bike path. The State has spent big $$$$ to renovate the former Falmouth train depot a couple of years ago with Cahir's past backing of supporting restoring train service when he was behind the previous renovation which included a updated platform, typical politics in action. Included a photo of Tom's RR platform to nowhere which still stands today as a reminder of a poor decision to end Rail service to the Town of Falmouth and the continued road congestion which has resulted, as people have no other options to get to this part of the Cape & Islands. Last edited by Falmouth Secondary to Otis on Sun Feb 03, 2019 10:01 am, edited 1 time in total. who otherwise might be drawn to patronizing The Flyer,particularly on Friday nights..